Toyota Motor Corporation (Toyota) and Suzuki Motor Corporation (Suzuki) have finally elaborated on their plans to work together not only in India but also globally by leveraging each other’s core strengths on electrification technologies (Toyota) and technologies for compact vehicles (Suzuki). The two auto majors had concluded a memorandum of understanding toward business partnership on February 6, 2017. 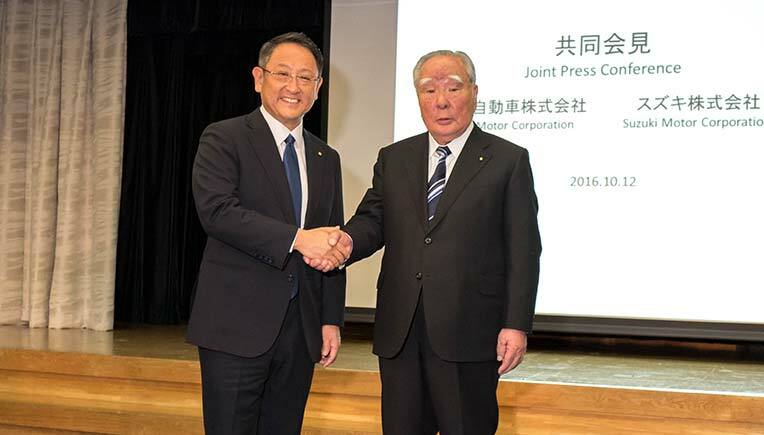 In addition to bringing together Toyota’s strength in electrification technologies and Suzuki’s strength in technologies for compact vehicles, the two companies now intend to grow in new fields, such as joint collaboration in production and in the widespread popularisation of electrified vehicles. Details of intended areas of collaboration are outlined in the table below. 1. Supply THS (Toyota Hybrid System) to Suzuki. 2. Widely spread hybrid electric vehicle (HEV) technologies in India through local procurement of HEV systems, engines, and batteries. 3. OEM supply of two new electrified vehicles built on Toyota platforms (RAV4, Corolla Wagon) to Suzuki in Europe. 4. OEM supply of two compact vehicles built on Suzuki platforms (Ciaz and Ertiga) to Toyota in India. 5. Toyota to adopt newly developed Suzuki engines for compact vehicles. Such engines are to be supported by Denso and Toyota, and will be manufactured at Toyota Motor Manufacturing Poland. 6. OEM supply of Suzuki’s India-produced vehicles (Baleno, Vitara Brezza, Ciaz, Ertiga) to Toyota, targeting the African market. 7. Drawing upon Suzuki’s expertise in developing vehicles in India, joint development of a Toyota C-segment MPV and OEM supply to Suzuki. 8. Production of the Suzuki-developed compact SUV Vitara Brezza at Toyota Kirloskar Motor Pvt. Ltd. (TKM) from 2022. Besides this, both companies intend to consider further collaboration to realise a sustainable future mobility society while respecting all applicable laws.